A little while ago, I made the decision not to look at my inbox until 9 am. I now try and meditate for ten minutes, exercise (even if it’s just 20 minutes bouncing on the mini tramp) have breakfast and jot down any ideas I have before I hit the emails. This simple rule has made such a difference to the way I feel and how much I can get done. It gives my body a chance to relax and digest, and my mind the opportunity to roam free, before my thoughts are hijacked by the inbox. I always assumed it was the distraction of the messages themselves that put paid to productivity, but new research suggests that the act of emailing can literally take your breath away, robbing the brain of the vital oxygen it needs to function properly. In fact, 80 per cent of people are thought to suffer from ‘email apnoea,’ a phrase coined by Linda Stone, a writer for the Huffington Post. Apnoea is usually associated with sleeping and is characterized by a sudden pause in breathing – and snoring. This common condition not only wreaks havoc on your sleep (and possibly relationships) but on your health too. In one recent Spanish study, researchers found that people with severe sleep apnoea had a 65 percent (almost two-thirds) greater risk of developing various types of cancer. They discovered the missing link was oxygen. After following 5,200 people for seven years they found that the more oxygen depletion participants experienced at night, the more likely a patient would be diagnosed with cancer during the study. The link between cancer and low oxygen levels has been known for over 80 years. The theory was first put forth by the Nobel Prize-winning physician Dr Otto Warburg in the 1930s. He believed that cancer cells are normal cells that have been forced to adjust to a low oxygen environment in order to survive. Instead of being aerobic, they become partially aneorobic and become dependent on glucose (sugar) for energy production. It’s for this reason that so many leading cancer experts recommend oxidative therapies – like intravenous ozone, hydrogen peroxide and rectal ozone – which work at the cellular level to encourage better uptake of oxygen. Oxidative therapies are real game-changes for cancer patients, and there is barely a week that goes by when I don’t receive a message from someone letting me know how crucial these treatments have been for their recovery. Just yesterday a lady from Melbourne posted a comment underneath one of my articles, mentioning how she had used ozone therapy, vitamin C and heat therapy to successfully overcome tongue cancer. 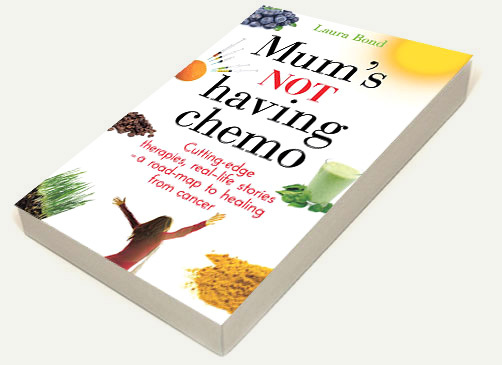 In my book Mum’s Not Having Chemo I share how other survivors have benefitted from oxidative therapies and provide the names of practitioners and clinics – around the world – who offer them. • Start humming: Walking and humming dramatically increases oxygen intake, according to Marcus Freudenmann producer of Cancer is Curable NOW: ‘The vibrations from humming soothe the nerves while helping to increase the flow of oxygen through the body,’ he says. There’s even a clinic in Denmark where patients walk through the garden humming and singing twice a day. 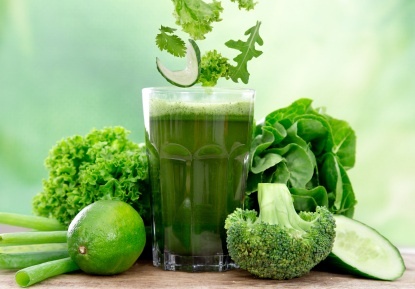 • Drink your greens: Green vegetable juice has become more ubiquitous than skinny jeans – but it’s more than just a fad. Drinking a potent green cocktail floods the body with vital enzymes, antioxidants and chlorophyll – which improves oxygen transport throughout the body. 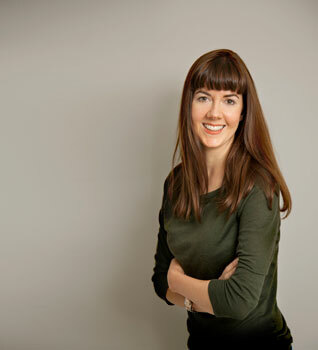 • Ditch stress: ‘Stress will cause you to take shallow breaths,’ explains New York-based cancer researcher Dr Kelly Turner. ‘After ten years of intense stress, you’ve got cells that have been starved of oxygen enough that their mitochondria might be damaged.’ Dr Turner thinks we can learn a lot from babies: ‘They take these beautiful belly breaths – they sleep a lot, they take naps, they’re not working all day and they’re moving,’ she says. *Download the APP: Breath Pacer, an iPhone application monitors breathing and displays optimal breathing rates. Slower deeper breathing not only switches on the parasympathic nervous system (think rest and digest) it can also help alkalize the body. • Exercise: ‘One of the best ways to oxygenate the body is by exercising,’ says integrative oncologist Dr Thomas Lodi. Going for a run, doing a few downward dogs or jumping on a mini tramp not only floods your body with oxygen but it also stimulates your lymphatic system – vital for removing toxins from the body – an helps de-clutter your mind, giving it a chance to re-set before it’s reloaded. Ploughing through emails often feels like a chore, but this week it’s been pure pleasure. Thanks to a feature in the Sunday Telegraph in Sydney, I have received a slew of messages from alternative health aficionados, natural cancer survivors… and even my old Montessori kindergarten. I appreciate you taking the time to get in touch and I wish all my new subscribers a very warm welcome. Many of you have asked where to purchase the book so I’ve created a list below of key stockists. AUSTRALIA: Dymocks, Collins and The Book Depository. Amazon does not have an Australian warehouse so the shipping costs are very expensive. UK: Waterstones, WH Smith and Dubray as well as Amazon.co.uk. In the meantime I hope you all enjoy the festive season – remember to keep breathing (a few deep breaths before bed might even help the hangover) – and I’ll see you in the New Year! 3 Responses to Are you holding your breath while emailing? Laura, a great post indeed. If only people could get to realise that they are deficient in things which are actually easy to put right themselves, without waiting for some highly qualified doctor to intervene and often give them poor advice – chemo etc. We were born with a brain, and should use it more – and when it too is well oxygenated it will work better. Have a nice green day! Dear Laura, I’ve been following your blog for over a year now, and I wanted to tell you it’s just so wonderful that you are bringing all sorts of these small (or big) but important things to our attention. I lost my mum to stomach cancer last year after a long and heartbreaking battle, and even though none of this will help her now, I’m grateful for the way you are changing my perception of life. I’ve bought your book, too. I wish you and your mother a long and vibrant life, and I hope very much that you will continue researching and writing. Dear Laura, I don’t know what it is, but we do have some sort of link in research, as I have just be researching about breathing and I came across this seminar that was in Perth in November, I unfortunately missed it. The breathing course is call the buteykno heatlh teaching people the correct way to breath. This technic can help reduce snoring, asthma, drugs and avoid machine and surgery and improve your immune system.